I love chocolate! And I know I am not alone–who doesn’t love chocolate? But I have learned a little secret about Hershey and what they don’t want you to know about GMO and non-GMO sugar. In the past, Hershey has used sugar from both sugar beets and sugar cane. But now the company is not buying sugar from sugar beet farmers. Why? Because the vast majority of sugar beets grown in the U.S. use a technology called Genetic Modified Organism (GMO). But what they don’t want you to know are foods that use GMO technology are safe and were developed so farmers can use fewer pesticides. So why do farmers use GMO technology? The GMO technology allows a small genetic change which results in the sugar beet tolerance of glyphosate or RoundUp. Prior to growing GMO sugar beets, farmers sprayed more toxic pesticides many times through out the growing season to keep weeds at bay. Using the RoundUp pesticide, sugar beet farmers now use much less pesticides because they can spray fewer times. Not only using fewer pesticides but glyphosate is less toxic than what they were using prior. Great for the farmers and great for the environment. Why Hershey made the change. According to Hershey, they claim that consumers want non-GMO sugar. There is a perception that GMO technology is bad for us. Unfortunately, there is a flood of misinformation about GMOs–things that are simply not true. So how does Hershey know that consumers do not want GMO sugar? It’s coming from activist groups such as GMO Inside and Green America. These groups (and many more) asked their members to contact Hershey and demand they eliminate the use of GMO sugar beets. And Hershey ignored science and caved . . . They don’t want you to know the difference between sugar from GMO and non-GMO sugar beets. Why? Because there is NO difference. None. After sugar beets are processed for the sugar, there is NO DNA present. What does that mean? Sugar is sugar is sugar. The sugar that comes from a GMO sugar beet and a non-GMO sugar beet are identical. No lab can detect any differences between sugar that comes from a GMO sugar beet and a non GMO sugar beet. The following chart is from the GeneticLiteracy Project. So what do sugar beet farmers do? Well, unfortunately, there is very little non-GMO sugar beet seed available and honestly, why would a farmer want to take a step backwards in regards to their health, the soils and the environment? It is so difficult being a farmer where you rely on science and research to make the best decision in growing the best food possible, but then in a “flash” because of some activist organization(s) who have never been on a farm, make a claim and demand changes where you literally erase all the progress made to the environment and the soils. Have we lost brain cells? Do we not think beyond our own self-centered ways? Why are we not using our critical thinking skills? Why don’t we trust science? What is happening to our society? So what can agriculture do? As I have researched this story and calmed down my anger, it has become apparent that we need to bring ALL of agriculture together. Yes, all the commodity groups have their own organizations but we aren’t speaking together as one. We need to form a coalition group that encompasses all ag groups. And yes I can hear it already–every reason this will not work. Well, if we don’t speak together as one, we will continue having to deal with these dumb decisions. In the meantime, farmers need to continue reaching out to consumers. And it needs to happen now. This is fascinating. I think we have been lead to believe that GMO foods are all bad for us without taking a closer look at the end use or the toxicity of using a non-gmo seed, plant. Wow………. had no idea that there is no diff between GMO sugar beet and non GMO sugar….hanks for the education on this. First there are NO GMO sugar beets. Only corn, maybe wheat has been modified. You are already eating said GMO food–check your packaging. Second, sugar is sugar, whether it is made from bacteria, sugar cane, sugar beets, etc. In the end, it doesn’t matter where it came from. Again NO GMO sugar beets. None, zip, zilch, zero. NONE. End of story. Which means no GMO sugar. Sorry to burst your bubble, but facts are facts. Well, I hate to burst your bubble, but there are GMO sugar beets. You learn something new every day! There are GMO sugar beets! And they work! But alas people cry fowl because they find it scary. So we’re back where we started. You find it scary, but there’s no reason to be scared of it. Seriously. We had this same argument back when bacteria were used to make recombinant DNA in the last century. But recombinant DNA gave us insulin. No one is saying that’s a bad GMO, are they? Actually, yes, there are a few fanatics that whine about GE insulin. There are a few misleading things in this article. Mostly pesticide use was promised to be reduced with gmos but that actually isn’t the case. Studies have shown that pesticide use has increased dramatically from 15million tons to 150million tons and not only that but the type of pesticides they are using now are called neonicotinoids . They are killing bee hives by the thousands and butterflies. If we don’t have pollinators we won’t have food. Definitely not good for the environment. There are now superweeds that are resistant to pesticides and insecticides. Which means producing even stronger chemicals to try to kill them which means more toxins on our food and more chemicals in our water runoff. Not good for farmers or our environment. Most gmo seeds are themselves registered as pesticides because they contain the toxins in their DNA. Sugar beets might be a little different but don’t be fooled, Gmos are not all processed to the point where there is no DNA. Think zucchini, gmo salmon just approved, papayas, corn, soybeans… we eat those as is. Not processed beyond recognition to a white powder like sugar. Sugar is sugar and neither gmo no conventional is good for you. Well thanks for responding Tiara. With the utmost respect, I can’t hardly agree with anything you have stated. I can agree that we are using more RoundUp since the use of GMO seeds. That’s because prior to the GMO technology, RoundUp killed everything so very little was used. I have been farming for nearly 40 years and I can assure you we use less pesticides and less toxic pesticides today than we ever did before the GMO technology. RoundUp is a herbicide and has no effect on pollinators. I, too, care about our pollinators but the research indicates there is a syndrome affecting them. Here is another report on that issue: http://www.ncbi.nlm.nih.gov/pmc/articles/PMC2169303/ And unfortunately, the articles you post are very biased. Thank you for the positive information. It is important for all of us to do our part putting truthfull information out there. Too many people get the wrong information from the media or Internet and just run with it. You are welcome. It’s my passion. Wanda, Your article refers to Roundup as a pesticide. Is this an error? Makes me doubt the accuracy of your information. Well, to be honest, pesticide is an all-encompassing word that includes both herbicides and insecticides. You are not the first person that has questioned the word pesticide. A common misperception. No, GMO seeds are not registered as pesticides, because you can’t have a toxin ‘in’ DNA. What you can have is a sequence of the DNA cause the plant to produce a toxin. I suspect that’s what you’re thinking about here, Bt in particular. The thing is, many plants produce toxins naturally. Bt is in fact an organic pesticide that is sprayed on just about every commercial organic crop you buy. None of your. Comments are true.weeds can become resistant we don’t make stronger chemical just change tactics like growing a different crop or grow no crop and cultivate the problem weed out. Very interesting and educational article. Tiara if you are so concerned about gmos, really all the plants are and have been genetically modified for ever that is why in part we are growing better yelds and better food to help feed a fast growing population and also if you are so concerned with chemicals then I suggest that you stop using chemicals on your lawn because if you figured out how much is used on your yard per square foot and fertilizers vs. what farmers use you would be shocked and oh yea don’t use bug spray on you or in your house. Just think about it while you are bad mouthing farmers and reading things that are one sided. I’m more concerned about the toxicity of high fructose corn sweetener than GMOs in my sugar. That being said, I’m a firm believer in labeling food that is a GMO product. People are entitled to know exactly what’s in their food. That’s why I love living where we do. You have s choice not to consume high fructose corn sweetener. You and I disagree because I don’t believe it’s toxic. But I do believe in moderation, as with all things. I would support a nation wide labeling initiative. It seems to make a lot of sense to not require food companies watch and adhere to potentially 50 different laws. Right now ‘Organic’ and ‘GMO-free’ are voluntary certifications. I think requiring things to be labeled ‘GMO’ would be akin to requiring things to be labeled ‘non-Organic’. As for exactly what’s in their food, it would be kind of like requiring apple pies to list the exact varieties of apples used. They’re all just apples. The fact that the DNA of one was intelligently vs. randomly modified doesn’t change the fact that it’s still an apple. There are some states that require GMO labeling, and that’s how I found out that my potato chips are made through genetic engineering. I think it’s pretty damn cool, really. Check your labels! 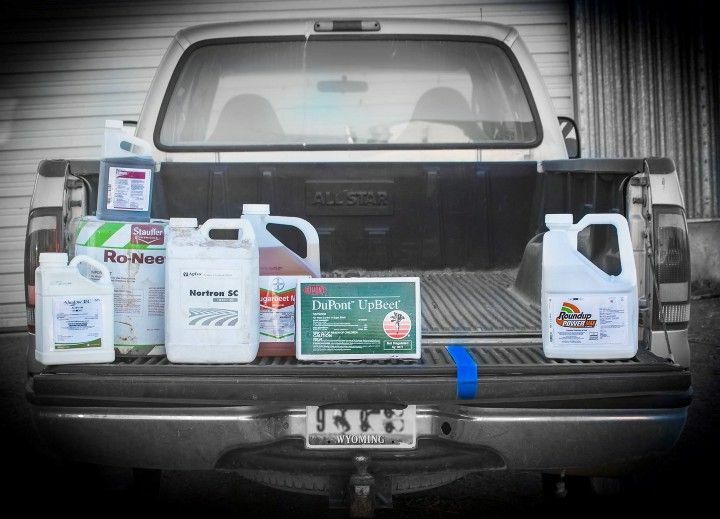 I think the pic I saw somewhere else of the non-GMO sugar beet herbicides per acre in a season on one side of the tailgate, and the amount of roundup used per acre on the other side would make a great addition to this entry. The visual impact of that is HUGE. I would agree! I need to find it. Do you have it? I don’t, sorry, but I bet if we ask around it can be found. Nice photo. Shows the point very well. The glory days of GMOs are rapidly coming to an end. The weeds and the bugs become resistant with amazing speed. The value of GMO traits rapidly goes to zero when farmers have to start buying expensive herbicides and insecticides again. Monsanto knows this, and has laid off a significant percentage of their employees. If Bayer buys Monsanto, they will cannibalize the trait stream, and lay off probably another 30-40% of Monsanto’s employees. Regarding sugarbeets, we’ll see farmers mechanically cultivating their fields again, in the next 5-10 years. GMOs had a good run, but the weeds and bugs have the final say. Well Nobody Special, why don’t you use your real name and a real email address? I would love to have a conversation but I need a real person to do. But that’s true regardless of GE. Organic farming also need to stay ahead of the bugs and the weeds. Farming that uses no pesticides and herbicides is great for your back yard, but doesn’t scale well to feed 7+ billion people. This also ignore the many other uses of GE, such as insulin and rennet. Finally, finally, I found someone that agrees with me on the GMO issue, It is crazy how it got such a bad wrap, but like I tell my friends, we have been genetically modifying seeds for a very long time, only breeding the best with the best. Carrots are not really orange, cucumbers have seeds, there would be no sweet corn to eat. We as farmers have to move forward or we will not be able to feed everyone if we stay like we were back in the 1920’s. Only 2% are in the farming industry, back in the 20’s 70% were farmers. Thanks Julie. It’s a rough road to spread the truth about GMO technology. But we have to keep talking and trying. You say “sugar is sugar” but then go on to argue that one sugar is better than the other. If “sugar is sugar”, then it makes no difference which Hershey’s picks or why. Where does she argue that one is better? I for one value the truth, and that means opposing misinformation. Hershey’s reasoning spreads misinformation about GMOs and sugar. Hershey is picking the non-GMO sugar because it will “market” better. But what most people don’t know is there is very little non-GMO sugar beet seed available. And it’s also really difficult to tell a farmer to take a step backward. Weeds are very difficult to control. Non-GMO crops mean spraying herbicide multiple times per growing season. With GMO seed, the number of applications is reduced significantly. Good for the environment. Good for farmers. safety assessment of GM foods has been based on the idea of “substantial equivalence” such that “if a new food is found to be substantially equivalent in composition and nutritional characteristics to an existing food, it can be regarded as safe as the conventional food.”4 However, several animal studies indicate serious health risks associated with GM food consumption including infertility, immune dysregulation, accelerated aging, dysregulation of genes associated with cholesterol synthesis, insulin regulation, cell signaling, and protein formation, and changes in the liver, kidney, spleen and gastrointestinal system. We have raised pigs for 40 years. The last 20 they have eaten GMO corn and soybeans. We see no ill effects at all from them eating GMO corn and soybeans. Foolish comment . For you to be correct. Most of the farmers raising livestock must be idiots who fail to see the symptoms. Nope, I am betting you got your errors from nonsensical outdated sites or anti-GE “”science sites””. Try posting actual links. You give a citation to the quote explaining what “substantially equivalent” means, but don’t give a citation for your “several animal studies”. I’ll go out on a limb and guess that Séralini is the author of at least one of them. There are a few studies that claim things like GMO soy causing tumors in rats. The Séralini paper was retracted by the publisher after numerous problems were pointed out with his protocol. There is no general mechanism by which GMO crops can be more or less safe than conventional crops. It’s possible for an individual (GMO or new conventional crop) to have a substantial negative side effect, but as soon as you make the claim about GMOs in general, you’ve moved from science to ‘not science’. Don’t believe it! Gmos are bad and the Glyphisate is even more dangerous. Do your research and don’t believe this article! Please backup your claims with factural resources. You can disagree with me but you need to show me credible information.